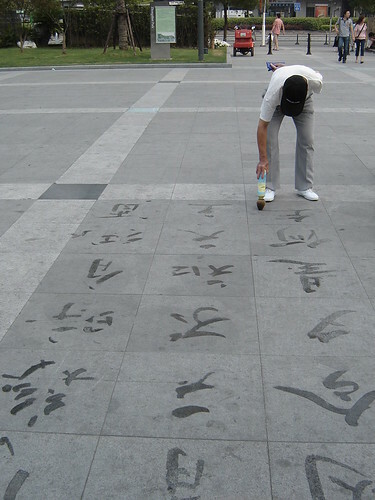 Street Art: Caligrafia Chinesa, originally uploaded by designative. Elderly people in China are always trying to find ways to keep themselves entertained (which good for their physical and mental health). It’s not uncommon to see ballroom dancing groups, Sword Fighting, Music Playing been practiced in pretty much every corner of major cities in China. This artist is practicing Chinese Calligraphy with a brush soaked in water on the side walk in the entrance Zhong Shan Park in Shanghai: makes one ponder on the contrast of the long history of calligraphy and the ephemeral aspect of his work, which in a hot summer day, only last for a few seconds.